The measure was voted down in the European Parliament on 9 July. The various calls in the Reda Report calling for fair contracts for creators survived. A PETITION circulated through change.org has catapaulted one of the most obscure corners of an obscure annexe of the mansion of authors' rights into the limelight. It is headed "EU to ban holiday pics". This is... mendacious. Untrue. It refers to the "Reda report" that is to be voted on in the European Parliament on 9 July. And it's a classic of scaremongering lobbying. Note: commercial. Nothing at all to do with holiday snaps. 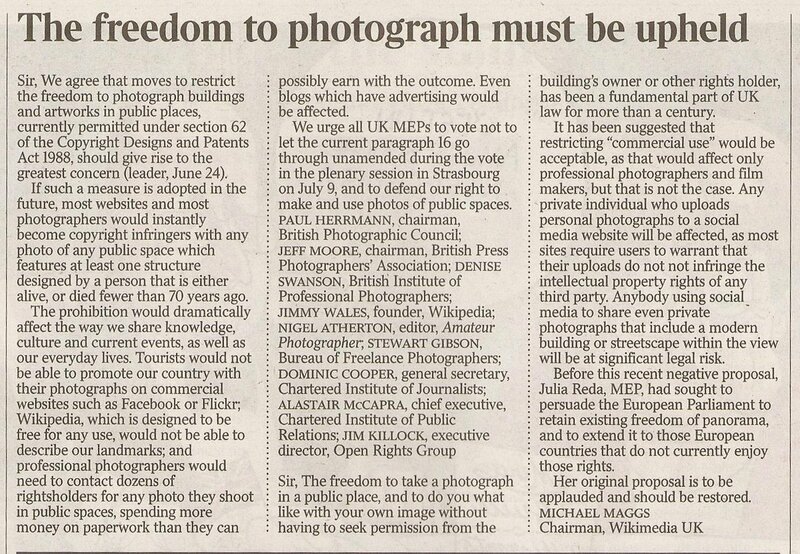 The petition goes on to raise alarm about the future of commercial photography. Will photographers have to get clearance from architects before taking street scenes? First: this report is merely advice from the Parliament to the Commission and is binding on no-one. Second: No. Even if the Commission accidentally proposed this be part of European law, and if it were passed, in the UK and Ireland at least it would be trumped by the "exception" to copyright that allows reasonable reproduction for the purpose of reporting "news and current affairs". In the unlikely event that the provision protecting architects in Belgium (which is the origin of the wording in the report) were extended elsewhere, it is possible that advertising agencies would have to get clearance before using images of the National Theatre or of a Sarah Lucas artwork to promote their clients. The Freelance hears a plaintive lament played on a very, very small violin. What is more alarming about the Reda report is that at the very last minute its call for fair contracts for authors and performers (including journalists, photojournalists and other photographers) was watered down by the insertion of a mention of "freedom of contract" - a cuddly-sounding phrase that means in practice "freedom for powerful corporations to impose contracts on individual creators". As Wikipedia is wont to say: those letters require better references. But this isn't one. Wikimedia may be.